Most Goleta folks know of an area called Ellwood. It’s used in conversation and directions, it even shows up on maps, but do you know why is it called that? According to this map, there’s an Ellwood Oil field, an Ellwood Canyon, and Ellwood sits proudly at 86 feet above sea level. There’s an Ellwood Station Road, Ellwood Beach Drive and of course, Ellwood School. So who the heck is Ellwood?! 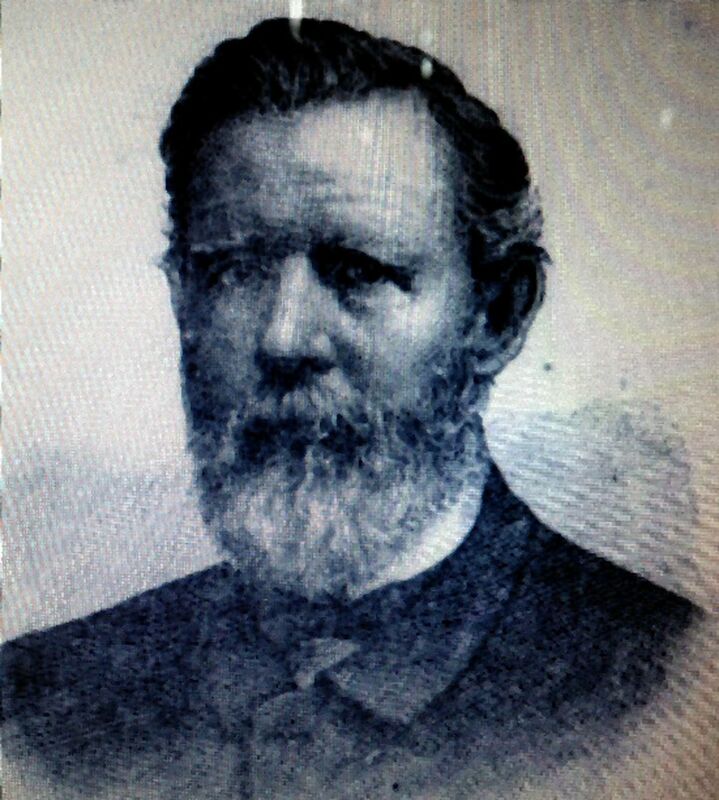 Born in Pennsylvania in 1829, he moved to Goleta in 1870. He bought 2,000 acres from the Den family at $22 an acre. He was very enthusiastic about his new home, writing to relatives on the East coast, “This is the Italy of America, the paradise of the western world, the climatic perfection of this globe!”. He was thrilled about the rich soil and had big plans for his new ranch, which became dubbed, “Ellwood Ranch”. He planted 400 acres of trees, including 7,000 olive trees, 4,000 Japanese persimmons, 3,000 almond trees, 1,000 other assorted fruit trees and 12,500 walnut trees, making him the largest walnut grower in California for several years. Ellwood also had a herd of 150 Jersey cattle from which he supplied butter to Santa Barbara and San Francisco. But olive trees were his first priority. He was convinced Goleta olive oil could compete with Italian oil. He built the largest olive mill in the United States and it brought world wide publicity to his ranch. But despite all the attention and Cooper’s notoriety as America’s “olive oil king”, the business was a failure. He just could not compete with the much cheaper oil from Sicily. In fact, his most lucrative crop were Japanese persimmons, growing quietly two miles up the canyon. But “Ellwood” was still a very popular tourist attraction, bringing celebrities and world leaders out on the “splendid” 14 mile road from Santa Barbara to see the ranch and gardens. His children served as tour guides and led the visitors through the working ranch than ran “from the low water mark of the Pacific Ocean back to the highest elevation of the sloping hills.” Pictured here is his daughter Fannie in the tourist favorite, “House Garden”, four acres that held about 1,000 types of plants and cared for entirely by Mrs. Cooper. Ellwood had other projects brewing. He became convinced that Blue Gum Eucalyptus trees could be a reliable lumber source that grew well in our climate. He imported them from Australia and planted a thick grove where Ellwood School is today. 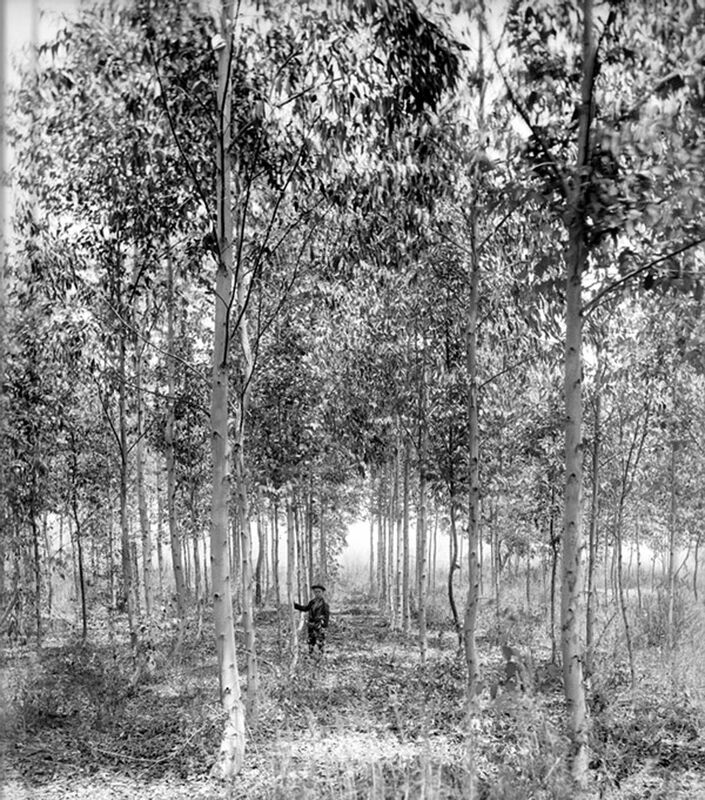 He wasn’t the first in California to plant Eucalyptus, but he was the first to grow them on a large scale for the market. He sold them all over central and southern California, and they were popular for use as windbreaks to protect other crops. Many can still be seen in use today. Unfortunately, they rotted in salt water and underground, making them useless as pier pilings or telegraph poles. Additionally, it couldn’t be milled into lumber because of it’s coarse grains and when it was dry it was very difficult to saw or split. So it’s only real value was as a windbreak. Today it’s most popular value is providing a temporary home for migrating Monarch butterflies. Yet another of Ellwood’s accomplishments was saving California’s walnut industry from extinction. He learned that ladybugs ate the black scale that was destroying the crops, and he imported thousands of them from China. In a matter of weeks, the scale was eradicated, and Cooper was a hero. To honor him, he was elected the president of the State Board of Horticulture for many years. Ellwood was the author of several books and numerous magazine, encyclopedia and newspaper articles on many topics, including politics and horticulture. Despite all of his achievements, he and his family lived in this modest house on his ranch for almost all of his life. He was a fun loving man and he spent a lot of his spare time on his private stretch of seashore, from present day Sandpiper golf course to Sands Beach. A fine stretch indeed. In 1909, his loving wife passed away, and he became sad and lonely. This prompted him to sell the ranch and move to the Arlington Hotel in Santa Barbara. He passed away at the Arlington in 1918 and was laid to rest at the Goleta cemetery, near San Marcos High School. So when you drive through the area we call Ellwood, remember the man that it’s named for, a man that loved Goleta, Ellwood Cooper. That’s a great story about the history of our neighborhood. Thanks for sharing.